We're not the first ones to come to this conclusion, but we're officially dubbing 2013 "The Year of Netflix." The subscription service has been popular for some time now, but it has knocked it out of the park as of late. Thanks to the revival of Arrested Development and stellar original programming, the company's stocks — and reputation — are red hot. Not to mention the fact that Netflix earned a whopping 14 Emmy nominations. We've already developed a serious addiction to pretty much every show, and the 2014 lineup isn't going to do anything to help us break away from our laptops. First up is the second season of Lilyhammer, a Norwegian-American series about a New York gangster that debuts in December. Frank Tagliano enters into witness protection after testifying against the Mafia and ends up in Norway. The idyllic surroundings are anything but boring; however, as Tagliano starts getting up to his old tricks (you know, blackmail, extortion, and the like). This show was actually the first of the Netflix originals; although, it didn't garner as much notoriety. This time around, the British mob is onto Frank and his not-so-legal dealings, which means the show will be graced with all kinds of English accents. That's a win-win. The next season of House of Cards will finally be entering our lives in February, but make sure not to get too attached. Sadly, it may be the show's last, according to rumors from executive producers. The team is hoping for more, obviously, but Netflix hasn't ordered episodes past the second season, and both Kevin Spacey and Robin Wright have their eye on movies again. But, if the rumors are true, the show will certainly be going out with a bang. 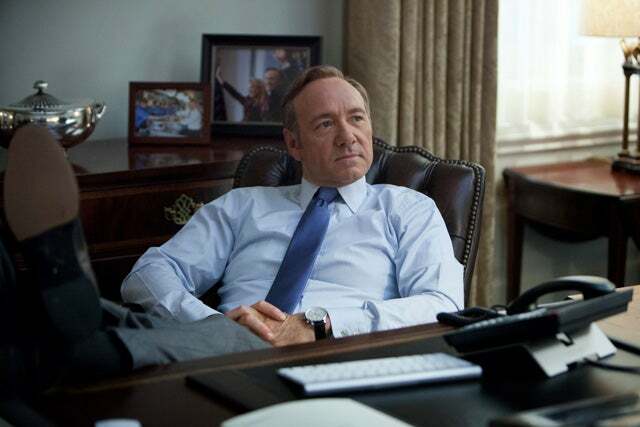 Spacey's Francis Underwood will be just as Machiavellian and sinister, and Zoe, Janine, and Lucas will be teaming up to bring his backhanded sabotages to light. Anyone with a special interest in political drama won't be able to shut their laptop. Netflix's other fan favorite, Orange Is The New Black, will be back for more prison goodness in the spring of 2014. Piper and her pals (or anti-pals) are the company's cash cow right now, so the team is pulling out all the stops. Season two is currently filming right now in New York, and Taryn Manning is back — which means Pennsatucky is alive and kicking after Piper's beatdown at the end of season one. Laura Prepon is on board as well, but there's no word yet on just how involved Piper's ex will be in the plot. We just know we've been really missing the ladies of Litchfield. Last but not least, the network's newest show in development has us majorly perking up. The series comes from the creators behind FX's Damages, and is being touted as a psychological thriller drama. It will center on a group of adult siblings who have secrets revealed when a black sheep comes back to town. Those are the only details that have been released as of yet, but we'll be sure to keep you updated on new information. We're already mentally preparing for our new addiction.